You can add your own libraries to the CloverDX Runtime classpath. Add your libraries under User Entries. Add Project adds the source code of a project and all libraries of the project which are marked as exported to the classpath. Note: Libraries can be marked as exported using Properties → Java Build path in context menu of corresponding project. Adds .jar file(s). The files have to be within the workspace. Adds .jar file(s). The files do not have to be within the workspace, they may be placed within an arbitrary directory on the file system. The Advanced button opens an additional dialog to choose not frequently used options. Adds a folder with .class files within the workspace. 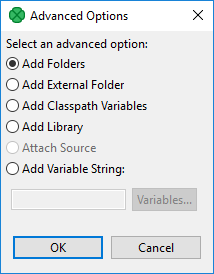 Adds a folder with .class files. The folder can be on arbitrary place within the system, it does not have to be in the workspace. Adds a variable name pointing to a .jar file, folder with .class files. It may be within the workspace or out of the workspace. Adds a library (.jar file or set of .class files with a predefined name). Opens a wizard for adding a library. 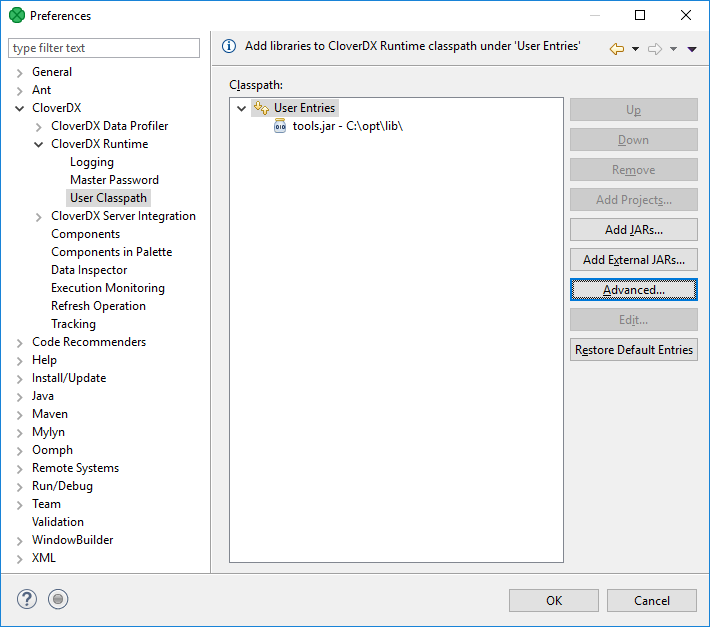 You can use it, for example, to add CloverDX Engine libraries. Adds an environment variable. The value of the variable will be added to the classpath.